The updated version of my “Blogging 101” presentation, and the pdf file of the “Blogging 101” article from the November/December ATA Chronicle are ready for download: you can either click on the previous links, or click on the Blogging 101 tab above. If you downloaded the previous version of the presentation, the text is similar, but I updated the links and some of the text. Since I could not be there, the presentation was given at the 51st ATA Conference by Corinne McKay (thanks, Corinne!). Thanks Riccardo! It was a pleasure to present on your behalf and people seemed really pleased with your presentation. I couldn't refrain from giving some unsolicited advice of my own, but I really tried to stick to your materials because they were so good! Hope to see you back home soon. I was looking forward to meeting you at ATA 51, but since you were not able to be there, I hope we can meet in Boston. Meeting Corinne, Jill, Eve, the Jenner sisters and other blogging translators in person was certainly a highlight of ATA 51 for me. I read your presentation (couldn't attend it because there was so much going on at the same time), and noticed something very important was missing: I think you should make blogging translators aware of the fact that a full-text RSS feed is crucial! I hate it when people publish their RSS feeds in "summary mode", since I read over 100 feeds and do not like to click on the "read more" link whenever I find something interesting. 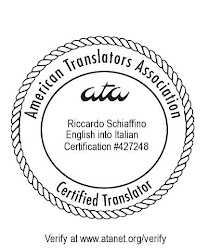 Since all translator's blogs are massively interesting it is really a pity when one of them forces you to click on the "read more" link to make us visit the blog and read the rest. By publishing a "full-text mode" RSS feed you show respect to fellow translators who are busy people and want to have access to your content in the most practical and painless way. Another very important factor to consider when blogging is SEO (Search Engine Optimization): using meta tags, writing descriptive instead of funny or literary post titles, managing internal links, distributing "link juice" only to trusted blogs, having excellent descriptive tags and categories related to what you do professionally, not repeating content in different posts/pages etc. etc. It is so important to think about SEO! It's as important as thinking about the content itself, since being good is not enough -- you have to show yourself to people so that they can see how good you are. And SEO helps you with just that. I lot of advanced tips on how to start and maintain a successful blog is given in my book "Fidus interpres". The book originated from my own translation blog, which has now reached almost 750 thousand unique visitors (more that 1,200,000 page views) in a little over 2,5 years active. I use SEO and other advanced blogging techniques in every single possible way just to make sure that my content -- which is still the primary focus despite all technology involved -- reaches its audience. Thank you for your thoughtful and detailed comment. As regards the "full-text mode feed", I use it for About Translation, but I was uncertain whether to recommed it in my presentation, since I personally don't mind blogs that only publish the first few lines of their posts... for me those are usually enough to see it is something I actually want to read or not. I find that the advantages of summary RSS feeds (quicker skimming in the RSS reader) counterbalance their disadvantages... but I will mention the pros and cons of this in an updated version of my presentation: thank for the tip! 1 – full feed, which works well if the blog is mainly textual but which can be quite disappointing if the visual aspect is an integral part of the post design and is meant to make posts more attractive to read (in RSS feeds, word wrap around images is lost, videos don’t always display correctly etc.). Unsurprisingly, I often end up clicking on the post link anyway to ensure the content “shows properly”. 2 – partial feed, which is generated automatically and can be quite annoying if bloggers don’t ensure the first few lines of the first paragraph provide relevant information about the post content. 3 – excerpt, which is written separately from the post content. A carefully composed one-line description can complement the title and let you decide at a glance whether to read or skip the post. I also think excerpts can be more informative than full content in the list view of feed readers and in aggregation sites (for a few examples, see how RSS feeds from our own blogs display in http://twitter.com/larassegna or http://www.facebook.com/LaRassegna). On a slightly different note, I think an interesting yet underused way “to show respect to busy readers” is to specify the title attribute with links, which in most browsers will display as a tooltip on mouseover. A short description of the linked page, or a quote from it, will let readers know why the blogger added it and it will help them decide if the link is worth following. As a blogger, I find the title attribute very helpful when I write a post that contains specialized terminology that not all readers might be familiar with, as it lets me add definitions as links, without cluttering up the post with extra text. Here is an example: terminologization. This Blog 101 presentation is really useful. When it comes to using the Web, I am a bit lost. Thank you for the tips and info! Great presentation. Where you thinking about recording it and posting as a clip on youtube, it will be awesome to share it with larger audience. That's a good idea... I need to see how best to do it. Thank you! I am using Camtasia for this purpose. You can use the PP presentation, add audio and record as a video. Youtube account allows you to place URL, in the info, as well as description under the posted video.